Are you first time user of TheIndia.co.in? don't worry! Checkout this video or follow instructions given below to learn about different features and detailed instruction on how to use them properly. You can sign in using Facebook, or sign up for your account by providing your Email address, Password and other required details. Don't forget to verify your account by clicking on the link inside the email we send to you. 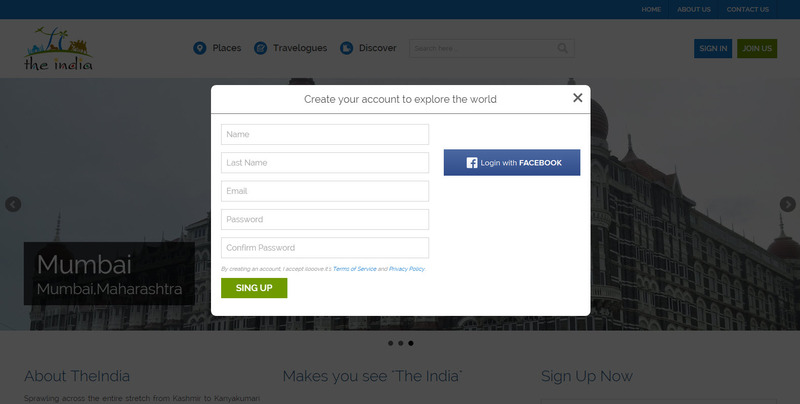 To share your pictures or places you visited, just Login to your account and go to the places page and click on the Add Place button. Now enter the place name and see whether the place is already there or not! If place is already added, you just need to select the place and start adding your photographs. 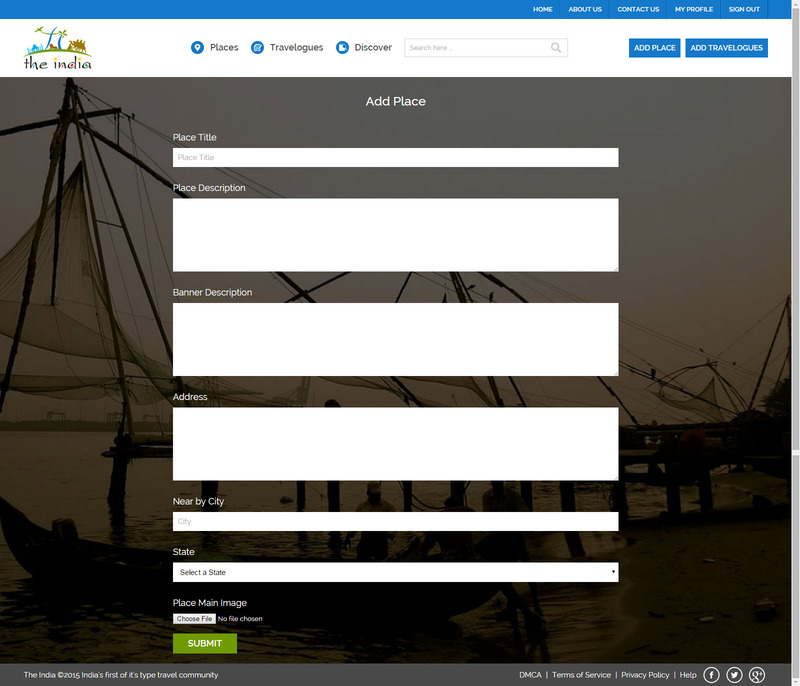 If the place is not available on TheIndia, you need to add the place by inserting required details of the place, Image, Description etc. Once you have added the place successfully, it will be added on website and you can start adding pictures as explained in above paragraph. See below screenshot or refer video for more information..
Travelogues is the section for avid traveler who want to share their travel stories with others. Travel stories can give useful pieces of information, such as why they enjoyed the destination so much, how to get there, must see places, nearby attractions and places to stay. If you want to share your adventure or interesting travel story then just click on Add Travelogues button and from here you can fill in the required details like Article Title, Article Description, Place and other important details. 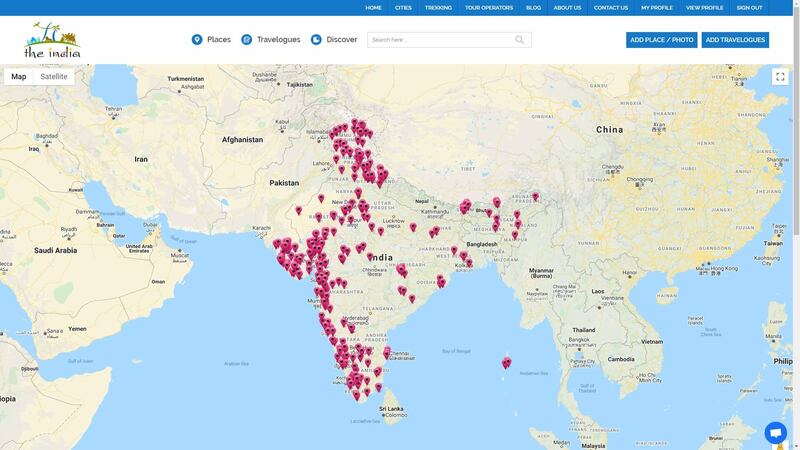 If you really want to find places in India that you have never heard of, you can use the map in our discover section. Every location uploaded by fellow explorers is displayed here. Click on a pin to show the location and click on the name of the location to see the place. The map and all pictures and travelogues are available as usual. You can see all your photographs and travelogues under your profile which is visible to all TheIndia visitors. If you have any queries, you can contact the team via the contact us page and one of our team members will help you as quickly as possible. Now start sharing your journey with all the amazing features of TheIndia and help fellow travelers to explores this beautiful country.